Driving the manual at first does look hard. You should be able to synchronize both feet to use the clutch, brake and gas pedals. In addition, you must also be able to control the steering wheel and gear lever accurately. Although it looks complicated, driving a manual car is actually fun. Especially for those who like to accelerate and enjoy the engine power of the car. As long as studied painstakingly and slowly, then driving a manual transmission car can be easily mastered. Most people who will drive a car actually already understand the functions that are in the car. But there are some drivers who think that driving is easy and easy, which assumes like that usually only people - people who want to rush driving on the highway. And if they realize that the hasty thing that can endanger themselves and others. There are many things to watch out for if you want to drive a car. If you want to start to drive a car then take a sitting position that can make you comfortable on the way. Because the seat also greatly affects your feet in the stamping of the brake, gas, and clutch. In applying the pedal that is on the right foot, left and center legs, you should really be able to fully tread for your journey to be safe. Before starting to learn how to drive a manual car, it helps you to start from learning the features and the ins and outs of the car's steering wheel. For example, start recognizing which gas pedal, brake and clutch, and how to use it. For example, the right foot for gas and brakes, while the left foot is just for stepping on the clutch. Not only there, you must also study the position of the transmission of the car and how to move from one transmission to the next transmission, the position of the neutral transmission lever, to reverse and others. See also the centimeter bag, indicators and all the features needed to drive a car. The key to success while learning to drive a manual car is to practice a lot with all the conditions and terrain. But at the beginning, choosing a spacious and quiet place is a perfect choice. In a field or empty area, you can easily start learning to start and run the car without worrying about cars jumping and crashing into trees or even vehicles and others. Once smooth in an empty area, start to increase difficulty by driving in areas such as highways, but search for the quiet and not many people passing by. If it is smooth, start to increase the difficulty as in crowded roads, uphill, intersections, congestion and so forth. Clutch is one tool that serves to break the engine rotation and wheel rotation that is still in touch, but it also serves to change teeth or add and reduce the tooth that you will use without damaging the gears in each transmission gear. Keep in mind again if you want to reduce or add teeth then you should not forget to step on the clutch pedal. So the main thing that exists on the car is the rotation of the car engine, clutch, transmission, and wheels of the car. When the engine is turned on then the engine undergoes as much as 1500 per minute, the number of rounds depending on the type of car respectively - each. You should know that the car engine has experienced a lap even though the car has not run. Because the rotation that occurs on the machine can not connect to the wheels so the wheels will not be able to move. So that connects from the wheel to the engine rotation of the clutch of the car. The engine with the pivot, the clutch and the wheel will be connected if the gears are in the position of 1,2,3,4,5, and R and with the coupling position there is no pressure. if the gear is in a Normal position (N) then the engine rotation, clutch and wheel will not connect. The difficulty that people experience when learning a car with a manual transmission is to align the gas pedal and clutch. If the clutch is removed too quickly and the gas has not been stepped on, then the car engine will die or falter. But if the gas is too large and the slow coupling is released, the engine will grow loud but does not move. Simply put, coupling and gas in a manual car can be likened to a seesaw. If the clutch is released slowly, the gas should be stepped on slowly. With lots of practice and concentration, you'll find the right alloy when to take off the clutch and step on the gas. In addition, you also have to divide the concentration to step on the gas, step on the clutch while moving the transmission and rotate the steering wheel properly. If the car has gone, prepare yourself to slow down or even stop your car. Never be afraid to take off the accelerator and hit the brake. Slowly, you will also learn how the car's response to the brake pedal you step on. 6. 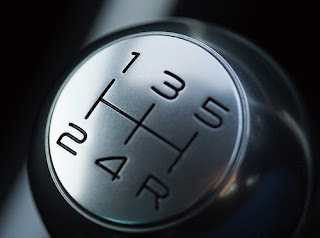 Moving the Transmission LeverHow to Drive a Car The most important manual is knowledge of the gear lever. When the engine is turned on and the sound is stable then move the transmission lever from neutral (N) to the position of the gear 1. The one gear is in the position of the upper left of the transmission lever, the lever must have no clues or writing or drawing the position of each tooth. Start the car by stepping on the clutch in full, moving the gears to the first gear, the right foot is ready in the gas position, lifting the clutch slowly until the car starts moving then lift the clutch fully until the car is running. Once the car is running then you can increase the speed by stepping on the gas slowly. Once in the sense of the car runs stable then start adding tooth to second gear when the car is running. By paying attention to the RPM indicator on the machine, if it is seen past the number 2 then it could mean that already melibihi 2000 times round in minutes so that is enough if you want to add tooth into 2nd gear. Then lift the gas fully so that the engine turns down again, then stomp the clutch fully and move to the tooth 2, slowly lift the clutch until half and then step on the gas slowly and coupled by lifting the clutch until fully lifted. How to recognize the car is to step on the clutch pedal with full and slowly lifting the foot until the sound of the engine sound down. Then start the car slowly while lifting the foot that is on the clutch pedal and step on the gas slowly. If you want to run the car then slowly lift your feet in the clutch position until the engine speed decreases and then step on the gas pedal slowly. You should be able to balance the gas and the clutch slowly. The way you should try repeatedly to pressure when stepping on the gas and remove the clutch can be dikominasikan.Selain you can also try to find the combination of gas and clutch to the maximum. In this case you should also be alert and concentrate on the handbrake if you have to stop in an emergency. If your clutch pedal is off too fast then your car engine will die. You should pay attention to the sound of the engine whether the car sounds like a car like to die or not then lalukan detention on the clutch pedal deeper. Excessive car engine turnover when the clutch on the stomp then it can cause quick clutch wear and clutch can also issue smoke. Clutch the clutch fully and hold it, this is one of the good things you should keep in mind to notice how the distance between the clutch pedal swing and the brake pedal or the gas pedal. And it is necessary to remove the clutch pedal carefully and regularly until you hear the sound of the engine has started to step on the clutch pedal so many times that you can recognize the sound of the car engine.